We have many collections (too many) including odd clocks, pieces of china, and old books associated with broadcasting. However the tin collection is one which has been built up steadily, and though there isn't a lot of information around (and what we can find relates to American can companies and isn't relevant in the UK), tins of all ages fascinate us. Not only are the designs often nice, and reflect the designs of the era in which they were created, but you can learn a lot about the time for which they were made. The collection began when we inherited among other odds and ends, two almost identical Bluebird toffee tins when a relative died. These were made in the 1950's or 60's and would have held toffees for dispensing by the newsagent/confectioner, for the pricely sum of 8d (that's 3.5 pence in the current UK currency) for four ounces. The toffees would have been weighed and bagged up in paper bags for the customer to take away and chew upon! 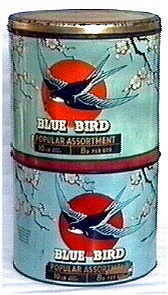 Since then the collection has grown, though Bluebird Toffee tins have now formed an important part of the collection. In total there are now some 115 tins of all sorts. Another area of specialisation is those tins which feature the Royal Family of the UK, dating back to the 1890's. 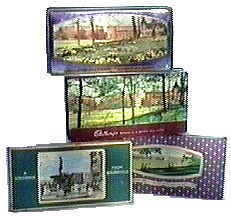 Another confectionary company which produced lovely tins was Sharps Toffees - we've half a dozen or so of those as well. Nearly all of the tins have come from boot fairs, costing between �00 and �00, though as we look for Bluebird Toffee tins, and the collection has become more 'serious', the prices have risen. The four Christmas tins featured on the Bluebird pages cost around �.00 each. We've also noticed that when we started to sport these tins some six or seven years ago, the costs were much lower...clearly those selling now know that these relics are valued by some. 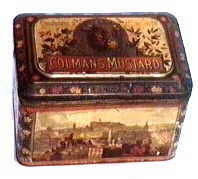 This Colman's Mustard tin is an example of those which would have sat on the counter in grocers' shops at the turn of the century, selling small amounts of powered mustard, which was then mixed with water at home to make mustard for meats. Given that there was little refrigeration, the mustard may often have been a necessity with somewhat 'high' cold meats, which were a few days old. In fact we're doubly lucky as we have found two of these tins - different times and different places. The tins are some twelve inches long by eight inches deep and stand ten inches tall. The top has a false inner lining to give it a smooth finish as the outside of the top is imbossed and very detailed. The Colmans logo appears in the bottom right of the lid interior. Another piece of luck gave us another Colmans Mustard tin, clearly of about the same period, but whether it came before, or after the other we don't know. The emphasis of the design is on the writing and graphics (the front picture if of Edinburgh) rather than the shape and 'glitzy' appearance. 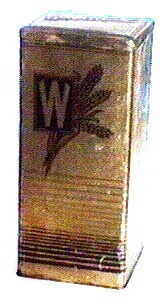 Obviously the design of these tins, as with any others, was intended to ehnance and increase sales of the product. The thinking about thow this was achieved must have changed considerably between these tins! Alternatively the tins were intended for different markets - glitzy for the English, and more down to earth and picturesque for the Scots! Another company making 'large' tins was Weetabix. 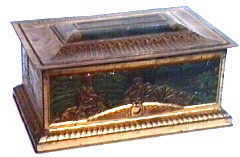 These were for home use (in order to preserve the product) rather than shop display. There are lots of modern designs around, but this one from (we believe) the 1920's is notable for its simplicity and remains a favourite. We've come across a number of these tins from 'Cadbury's' chocolate. If you'd like to know more about them click here. Finally we collect Royal tins, and have around 40, some more than 100 years old. We've put a small collection of historic tins here for you to see. Note from the editor: These images are taken from grabs of video tape...apologies that the image isn't as clear as some...but it's a lot cheaper and quicker than other methods. If the site is popular, we'll revise the way it's been created and make improvements! There are links to other tin sites here.